Vice-President Jeanne Doorne welcomed 46 members to the June meeting. The record of the last meeting was approved and signed and the business matters dealt with. To commemorate the 100th anniversary of the WI additional bursaries for Denman College had been created and our secretary Kate Dilks had more information for any members who were interested in attending a course at the college. Members were reminded that the Pot Luck Lunch will be on July 28th. Kay Hygate had been our delegate at the WI AGM in Liverpool. To read her report please click on the link past events. After coffee, we welcomed Ms. Roz Burton who told us about how she had changed careers from IT to making soap. Roz uses the cold press method which although longer than other methods uses less energy. She uses Olive Oil, Coconut Oil with essential oils for the scent and plant extracts for the colours. She answered questions during her talk and Barbara Buckie gave the vote of thanks. 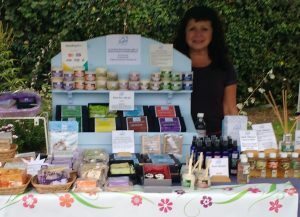 Photo kindly supplied by Roz of her with her stall of produce at a recent market.